If you love water adventures, but feel guilty for leaving your dog behind when you go on your trips in nature, we may have a solution for you – kayaking with your dog. Many dogs love the water and would give anything to be with their owner out there, in the wilderness, having fun. So next time you’re about to go on a nice water trip, take your dog with you and share the kayaking adventure with your furry best friend. Of course, before you can do that, you need to pick the right kayak for you and your canine pet. Because the market is actually oversaturated with kayaks and canoes, we’ve put together a list of the best kayaks for dogs to help you find the perfect watercraft for you and your pooch. Read on to find your favorite and start your water adventure as soon as possible. The Lifetime kayak is large, sturdy and stable – all you need for your first kayaking-with-a-dog experience. And although the name suggests otherwise, this kayak can actually fit three people, so you and your dog will have plenty of space – so much actually, that you can take another person, or even another dog with you. The hull is designed to provide maximum stability, so even if you have a particularly rambunctious dog, this kayak is sure to keep you both firm and stable. It’s made of high-density polyethylene and comes with a 5 year limited manufacturer warranty. Inflatable, comfortable and durable, the Sevylor kayak is a perfect choice for either two people or a person and a dog. Talking about durable, the bottom of the kayak is made from 1000D tarpaulin, while the 840D nylon cover provides excellent protection from punctures. There are two adjustable seats, which is great news not only for your comfort, but for your canine pet’s comfort as well, as you can move the seat closer or further from yourself as needed. And if you get tired of paddling, you can store the paddles in the convenient holders, and add the Sevylor trolling motor. If you’re a total beginner at kayaking with a pet, you need a watercraft that’s stable, affordable and easy to use. That’s what the Sun Dolphin Bali SS is all about. With a spacey, comfortable seating area, adjustable foot braces and paddle holder, this kayak is great for kayaking beginners – both human and canine. Made of Fortiflex high-density polyethylene, with a stable hull, the Sun Dolphin Bali SS is durable and quite sturdy – easy to control, especially when moving slowly. 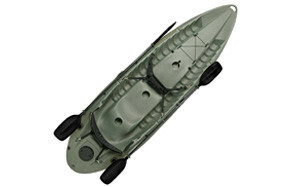 This kayak comes with a portable accessory carrier (PAC), a handy thing that can be used as extra storage. One of the best-rated kayaks currently, the Sea Eagle kayak is spacey, comfy and durable – a perfect watercraft for kayaking with a dog. It can comfortably hold two persons (or a person and a dog, of course), but even three can fit if that’s what you want. 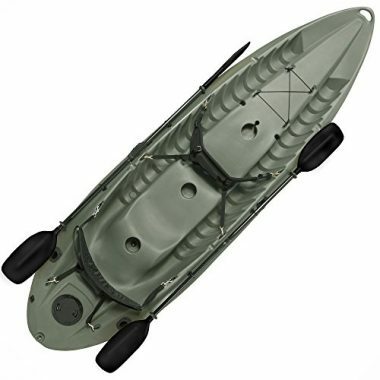 Made from a sturdy material, K-80 Polykrylar, this kayak is tear-resistant, durable and designed for stability. Paddling is easy and comfortable too, as the kayak is made from 5 I-beam tubes which help the rider sit stably, as his or her weight is born by the entire floor, not side chambers. The Old Town Canoes & Kayaks Vapor 10 is one of the most popular kayaks on the market – and for a good reason. It’s durable, stable, comfortable, easy to control and has a large cockpit – perfect for one person and a medium sized dog. Made from durable single layer linear polyethylene, with adjustable padded seats, comfortable thigh/knee pads, a paddle-rest and Glide Track Foot brace, this kayak provides ultimate comfort and ease of control. With a rather large cockpit, it’s incredibly easy to get inside the kayak, as well as out of it, with or without a dog. 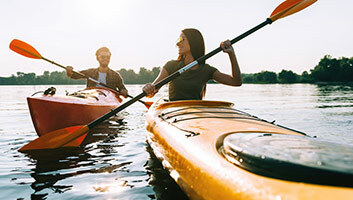 Another hugely popular kayak, the Ocean Kayak has one of the largest capacities on the market – it holds up to three persons, or a person and two dogs, two persons and one dog. It also comes with a few highly useful accessories. 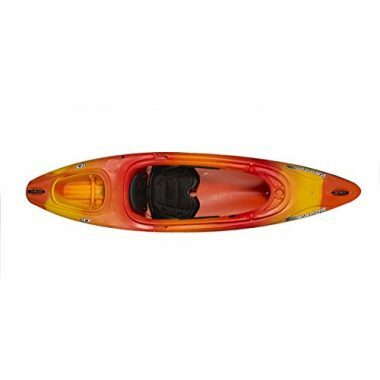 Made of single layer polyethylene, this kayak is durable, sturdy and stable, no matter where or who you are with. There are three seating positions, where one, two, or three persons can be paddlers. Gear straps are also there, as well as patented overlapping foot wells and side carry handles. Compact and versatile, the Ocean Kayak Two Tandem is the perfect choice for you and your dog(s). Another kayak from Lifetime, this one too is one of the most stable and reliable kayaks you could find. With two-person capacity - or a person and a medium to a large sized dog – and tunnel hull design that makes tipping over almost impossible, this kayak is one of the best watercrafts for kayaking with a pet. 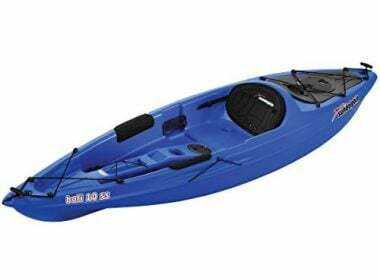 Made of roto-molded polyethylene, with two soft backrests and two double-sided paddles, this Lifetime kayak provides ultra stability and tracking, as well as great comfort and ease of use. 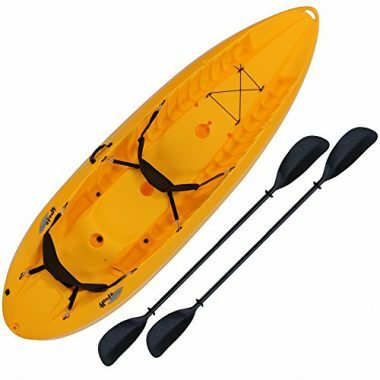 There is a molded front carry handle, the paddle is included, and the entire kayak has a 5 year limited manufacturer warranty. The Perception Pescador Pro kayak is designed for peak performance – it’s highly stable, sturdy, comfortable, and can fit one person (peddler) and a pet no problem, making it one of the best watercrafts for kayaking with a dog. The hull is made of polyethylene and the entire kayak is quite spacey, with plenty of room for storage. The seat is removable, with two positions – upright and recline – and can be adjusted whenever and however you like using a recessed track. As for accessories, there are dual molded-in rod holders as well as stern tank well with a mesh gear cover. Now that we’ve covered the reviews of eight different kayaks for dogs, it should be easier to pick the right one for you and your hound. But if it isn’t, don’t worry – we understand that you want the best for you and your pet in terms of price, safety and durability, but with so many different boats on the market, choosing the right product can be a little overwhelming. That’s why we’ve prepared this simple, but hopefully useful buying guide. In here, you can read all about the types of kayaks for dogs on the market, which ones you should pay attention to, and which ones you should stay away from. We also write about the features you should be looking for, as well as the safety tips you may want to follow on your next kayaking adventure. Finally, we also answer some of the FAQs down below, so make sure you check them out before actually purchasing a kayak for you and your canine companion. There may be hundreds of different kayak models on the market, but not all are actually suitable for dogs. Some kayaks are an absolute dream for people, but for people plus dogs? Not so much. These types of kayaks are usually too small for our furry friends, or are too unstable to support highly energetic animals. So which kayaks are dog-friendly? Certainly, some kayaks are marketed specifically for dogs (plus owners, of course), and that clears up things a little, however, that’s not always the case. Many kayaks are perfectly dog-friendly but they’re not marketed as such. In fact, none of the kayaks we reviewed here are. Sure, some may note that they’re safe for canines as well, but none of the kayaks actually had a noun ‘Dog’ in their name. Does that mean they’re not safe? Absolutely not – dog-friendly kayaks do not have to be marketed as such in order to be suitable for our four-legged friends. They do, however, need to possess certain things, be of the right size and the right kind of material. We’ll talk about that in more detail later, but for now, let’s focus on the types of kayaks that are best suited for our furry friends: recreational and sit-on-top kayaks. Recreational kayaks are mainly enclosed boats. They’re best suited for casual (recreational) paddlers and should be used on calmer waters, such as lakes or small and calm rivers. They have larger cockpits than sit-on-top kayaks, as well as wider hulls, which makes them quite stable, but also not good for tracking as they can’t maintain a straight line very well. They’re also slower than sit-on-top kayaks and have less room for storage. Speaking of room, recreational kayaks can hold small to medium sized dogs, but absolutely cannot fit larger canines, unless, of course, you buy a tandem recreational kayak that has an extra seat – in that case, even your large dog may be able to fit. 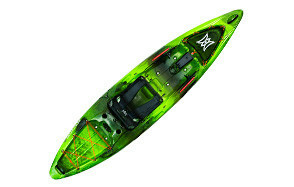 Sit-on-top-kayaks are completely open watercrafts, with plenty of room and stability. And although the recreational kayak is dog-friendly enough, it’s mostly made for people with smaller dogs, who only want to keep their pets between their legs, which is why we chose to review only open kayaks. These types of boats are super easy to get into and out of, and are perfect for various dog sizes, including the really large hounds. Generally, they can hold two to three persons no problem, so your dog(s) will have plenty of space. There’s usually also enough room for storage, so you can bring your gear and many other useful things with you. The sit-on-top kayaks are also mostly stable, which is a crucial thing to look for when you’re kayaking with your canine – trust us, the last thing you want is to tip over in the water with a scared dog. So, recreational or sit-on-top kayaks? There’s no right or wrong here – depending on the size of your dog, as well as your needs and preferences, pick the kayak you think both you and your loyal furry friend will like. Speaking of right and wrong, are there certain types of kayaks you should avoid when planning to go kayaking with your dog? There are, actually – sea kayaks and whitewater kayaks. Sea kayaks are great if you’re an adventurer who loves exploring unfamiliar waters as these boats are built for water sports (paddling). They’re small and fast watercrafts with a covered deck, and usually hold one to two persons. The reason why they’re not ideal for dogs is that they’re quite narrow – so much that maybe only a small sized dog could fit in. Even then, you and your pooch would probably be a little uncomfortable. Whitewater kayaks are even smaller than sea kayaks – built to help the user steer the entire kayak with his or her body, these boats provide a tight fit, meaning there’s basically no room for anything else other than the person using the kayak. For this reason, whitewater kayaks are a definite no-no when it comes to kayaking with a dog. No matter which kayak you choose to buy – recreational or sit-on-top – there are certain things all dog-friendly kayaks should have. Kayaks in general need to be sturdy and made of a durable material, but even more so if dogs are going to be frequent visitors. No matter how well your hound is trained, you can bet he will scratch the watercraft with his claws (unintentionally but sometimes even intentionally) and maybe even try to chew certain things, depending on the breed and the situation. Thus, it’s crucial to only go for highly durable kayaks. Sure, you can take your dog on a water trip with you by putting her between your legs, but is that really the most comfortable position for you and your pooch? Not really – most larger dogs prefer riding in their own seat, which is why you should always look for kayaks with two seats. Of course, there are always those pets who love to be next to their owner at all times, and if that’s your dog, then feel free to put her in the cockpit, between your legs. This, however, is only recommended if you have a small, timid or overly excited pooch. Consider also the weight of your dog – if you have a particularly large and heavy dog, make sure your kayak will be able to support both you and your pet, as well as the gear you’ll be taking with you. Kayaking with your four-legged friend can be extremely fun, especially if your dog loves water and is adventurous. However – although you may not mind being flipped out of a kayak from time to time, your dog probably does mind. Getting tossed out of a watercraft can be disorienting and as a result, a traumatizing experience for a dog, especially if he’s not a particular fan of the water. The first thing your pet is likely to do when turned over is head for shore. No matter how good of a swimmer that dog may be, if he’s against some serious rapids, it’s unlikely he’ll actually reach the shore. So please, before buying a kayak and actually heading off with your loyal friend by your side, make sure it’s as stable as a kayak can be. 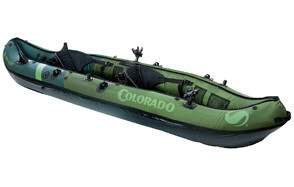 Look for sturdy, wider kayaks, with stable hulls that will make floating easy. While kayaking with your canine pet should be first and foremost fun and a great exercise for both of you, you can’t forget about the safety. You may be great at taking care of yourself, but your dog, who is the first time out on the water? Probably not that great. That’s why you need to think for both of you when it comes to safety. To help you make your kayaking with a dog experience pleasant and safe, we’ve put together this handy list of things you need to do/take with you before you step into your kayak. It should go without saying that a dog you plan to take with you on your kayak trip should be at least somewhat trained. Basic commands, such as ‘get in’, get out’, ‘sit’, ‘stay’, ‘jump’, ‘come back’, etc., should be learned, as you never know how a canine will act when placed in the middle of a large body of water. This is where dog treats can greatly help – if your furry friend gets too excited or scared, offer him a treat as an incentive to calm down or do a certain thing. Besides being at least somewhat trained, a dog going kayaking should also be acclimated to that particular kayak. You want to start doing this while you’re both on land. If your pet seems curious but a bit scared of the new watercraft, don’t just throw her in the kayak and expect her to know what to do. Instead, give your canine buddy a chance to explore the kayak a little and become familiar with the new object. Then, sit in the kayak yourself and invite her to join you. Do this several times, preferably throughout a few days before actually going out on the water. It’s important to take it slow and let your dog become completely comfortable with the kayak. Offer treats, let the pet sleep in the kayak and have fun together – while you’re on the land. The goal is to have a dog that’s not only neutral towards the kayak, but actually loves spending time in it. However, you should know that there are currently no dog life vests that have been approved by the Coast Guard, meaning they’re unlikely to keep your pet safe if he’s unconscious simply because they’re not designed to keep the dog’s head above water. Still, dog life jackets do help in buoyancy and in saving the animal’s energy if he needs to swim for a long time on its own. If you don’t have a dog life vest, a personal floating device (PFD) of any kind is still better than nothing. You know better than to go out in the sun for extended periods of time without a sun protection, such as a long-sleeved shirt, a hat, and of course sunscreen. But did you know your dog can get sunburnt just like you if she doesn’t wear sun protection? It’s true, which is why you really want to apply SPF on your dog when going kayaking. Your pet’s certain body areas, especially those not covered by fur such as the nose and inside of ears, are susceptible to sunburns. Even those areas where the fur is less dense, such the belly ad groins can get sunburnt if your pet stays out in the sun for too long. 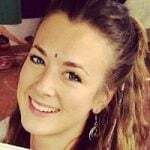 The result is red, irritated and painful skin, and sometimes even hair loss. Therefore, make sure you apply sunscreen on your dog before hitting the water, as well as during your trip (every two hours, or so). If you’re wondering which sunblock to use for your four-legged companion, the PetMD recommends sunscreen specifically designed for dogs. And if that’s not an option? A broad-spectrum sunscreen that doesn’t contain fragrance and zinc oxide should be fine. If your dog is overly excited or rambunctious, you may think it’s a good idea to tether him to a kayak – but it’s not. In fact, it’s one of the worst things you can do for your dog’s safety. In the case the watercraft gets flipped over, your dog needs to be able to swim. With a leash tied to the kayak, he may not be able to – he may get trapped under the kayak or the leash may get caught around his limbs. Until you figure out what’s going on and untie your dog, it may be too late. Therefore, never tie your pup to a kayak or any other watercraft for that matter. You can take the leash with you for when you and your pet are out of the kayak, but do not use it while you’re still inside. When kayaking with a dog for the first time, it’s good to take it slow and stick to calm waters. The dog’s first time out on the water should be fun, pleasant and not very long, as you want your canine friend to accompany you the next time (and many more times) you’re kayaking. For this reason, avoid whitewaters and paddling too fast – you don’t want to stress your pup or make her nervous, but let her enjoy her water adventure so she can look forward to more. Of course, once both you and your furry friend become kayak experts with years of experience, you can make your trips longer and more exciting. Make sure you talk to your dog’s veterinarian before going on a kayak adventure. This is especially important if your dog has medical issues, such as weak heart, diabetes, etc., as you want to make sure you have everything you and your pup need with you on board. Furthermore, if you and your dog have been spending a lot of time around water, it’s a good idea to get him checked. Mosquitoes are known to thrive around large bodies of water and you never know whether some of them are infected. You want to protect your four-legged friend against heartworm, so make sure you tell your veterinarian you’re training the dog for kayaking. Nobody goes out kayaking expecting to get hurt, but water sports can be very dangerous for both people and animals. Truthfully, no matter how experienced you may be, accidents can and do happen. So get pet insurance before you go kayaking to cover all your basis. This way, if your canine companion gets hurt, you won’t be stuck with an expensive vet bill, and you and your dog will be much happier for it. Q: What Kayaking Gear is Necessary for Your Dog? A: You know you need a few essentials in order to stay safe and sound on the water, but what about your dog? Things are not so different here – sure, he may not need to bring a change of clothes, but he too needs to eat, drink, sleep, play and even have a few emergency essentials. Let’s check them out. As mentioned before, it’s wise to put on a life vest on your dog, even if she’s a good swimmer. You never know what can happen, and just in case your fluffy pet needs to swim on her own to the shore, get her a lifejacket. If you really want to be ahead of things, put one on your pet and take one more with you. This is useful if you’re planning to do an overnight trip and you forget or lose one dog life vest along the way. A dog’s gotta eat, right? Bring food and fresh water with you, as well as a drinking bowl and dog water bottle. Dogs that love water will probably jump in and swim around from time to time, and that can really tire them out. To re-energize them, bring their favorite food and feed them at times they normally eat or more frequently than that. If you’re in salt water, don’t forget to bring fresh water with you and hydrate your dog regularly. Also, don’t forget the dog treats! You really want to reward your pet’s good behavior so she can learn through positive training and maintain her good habits. If you want your furry companion to be safe even when you get out of the kayak, bring a leash with you. As a matter of fact, it’s a good idea to bring an extra leash, just in case the first one gets lost (you know how those things easily disappear!). You may also want to take a harness with you – if your pup falls off the kayak, you can pull him up easier with a harness than without one. If you’re planning to spend a whole day (or even a couple of days if making an overnight trip) out on the water, it’s wise to bring a few medical essentials with you. We already mentioned a sunscreen for you and your pet, but if your dog has sensitive feet or is prone to injuries, you need to take a few more things, including a hydrogen peroxide for unexpected small cuts, and maybe even some vaseline for sore doggy feet. And of course, if your dog has a medical condition and needs medication in order to control it, don’t forget to bring it with you! Dog toys may not be essentials, but it’s good to take them with you to make the whole kayak adventure super-fun for your dog. Water toys are a great option if your pup loves to swim around, but regular toys are also welcomed, especially if you’re doing an overnight trip – when on land, let your pooch play around. Toys are also a great way to reinforce good behavior. Q: Hard-shell vs Inflatable Kayaks – What’s the best? A: And finally, it’s time we deal with the hotly debated topic amongst kayakers – inflatable or hard-shell kayaks, which is better? Truthfully, there no ‘the best kayak’ – it all depends on your own needs and preferences. As with most things in life, both rigid and inflatable kayaks have their pros and cons, so ultimately, what you want is a watercraft whose pros fit your own preferences and needs, and whose cons you won’t mind much. To help you decide which kayak is the best for you and your pooch we’ve outlined the advantages and disadvantages of both types of kayaks. Rigid or hard-shell kayaks are the traditional kayaks usually made from plastic, wood or other materials. Always ready to go: to use a hard-shell kayak, all you need to do is bring it with you to the water. That’s literally it – there’s no unrolling, inflating, deflating or anything of the sorts. You just transport the watercraft from the car to the water, and when you’re done, from the water to the car. This saves you time and energy and doesn’t make your dog wait around. Very stable: since rigid kayaks are usually heavier than their inflatable cousins, they’re more stable and sturdy on the water. This is particularly useful if you’re out there in very windy, stormy weather with a scared pup. 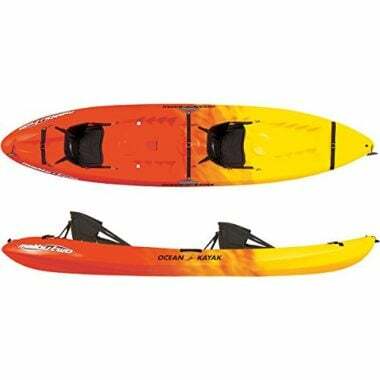 More maneuverable: hard-shell kayaks are designed to be fast and easily maneuvered. Generally speaking, they give more control than inflatables, which is helpful in general, but especially if when there is a nervous and scared animal beside you. Heavy and big: because they’re rigid, hard-shell kayaks can be difficult to store and transport. This is particularly problematic if you live in an apartment and don’t have a garage. Since they’re heavier than inflatables, they can also be difficult to transport from car to the water, depending on where you parked. Need more maintenance: rigid kayaks are prone to bumps, lumps and scrapes and may require a bit more maintenance than inflatables. This is especially true if you want a wooden kayak (which is why you won’t find one reviewed in this article). These kayaks are the modern versions of traditional kayaks that need to be inflated before use and deflated after use. Lightweight and easy to store: perhaps the biggest advantage of inflatable kayaks is their light weight. They are small and compact and easier to store and carry than the hard-shells. Many inflatables are super-lightweight and when deflated can fit inside a car’s trunk or even a backpack. If you don’t have a garage, this is the kayak for you. More affordable: generally speaking, inflatable kayaks are more affordable than their rigid counterparts. Of course, the high-end inflatables can be as expensive as hardshells, but you don’t need to go for those if you’re a beginner. Require less maintenance: an inflatable kayak is made of flexible materials that are less prone to scratches and bumps than the rigid materials used in hard-shell kayaks. However, some models may be prone to punctures, but these are usually cheaper alternatives. 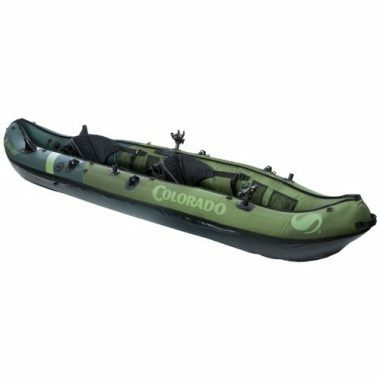 Need to be inflated: unlike the hard-shell kayak that you can just unload from your car and put in the water, an inflatable boat needs to be inflated first before you can use it. Of course, some kayaks inflate in less than 10 minutes, however, more affordable alternatives may require more time. And then there’s also deflating – before you can store your inflatable boat, you’ll have to deflate it. Harder to control: because they’re lighter than rigid kayaks, inflatables are harder to control. This is a particularly negative trait if you’re stuck in the middle of a large body of water during inclement weather. Still, it should be said that the newer inflatable models are more stable and easier to control than ever.